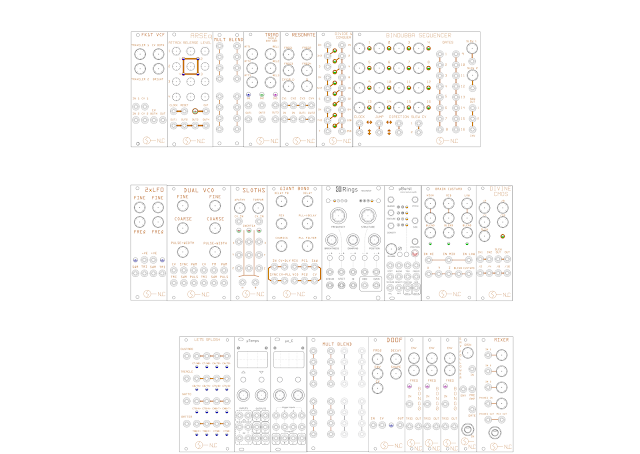 Welcome to my blog for sharing the CAD drawings (dxf and svg) of ModSynth modules. My primary motivation for creating these is to print out and use as "patch maps" drawing in lines as the patch cables and drawing the angle of the knobs used in a particular set up. On these I use the notation FR or FL for Full Right rotation and Full Left rotation respectively and often cross out unused plugs and modules. Update: I have since found that many of the panel artworks are available as pdfs at http://www.sdiy.org/pinky/data/data.html I still like to put n the knobs with angle markers and jacks so as to make it as I see it and also the blocks in the CAD (I use qcad) make it really easy to shift things. I was pleased to be able to get that lovely NLC font though, I'll have to update all the old ones now! ...all in good time.